After centuries of mankind’s increasing reliance on robots, they turn on their makers and wipe them out. That’s not what this book is about though. 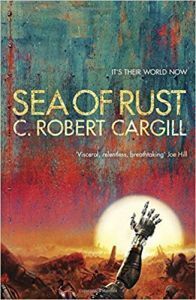 In Sea Of Rust we find out what happens next when robotkind and the huge AIs that helped them win their freedom are left to themselves.